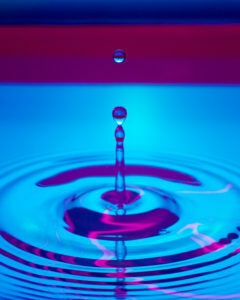 Though the speedlight (1/8 power) freezes the motion water droplet, the ability to manually set the exposure triangle is necessary. 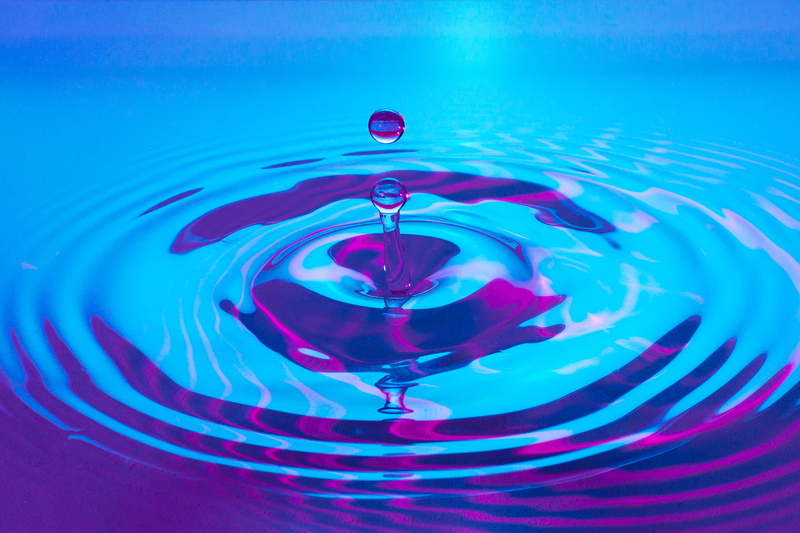 Due to constraints in lighting placement, shutter speed is 1/60 rather than the customary image-stopping shutter speed of 1/250 that I have seen used in water droplet photography. Aperture of f/8 maintains a deeper depth of focus that rather than the wider aperture that P or S might have chosen in low light. ISO 100 to ensure lowest potential for noise in the image. Other “manual” attributes of this shot: Custom made drip support from 34″ length of 3/4″ PVC pipe drilled at ends to mount on light stands and center drilled to insert eyedropper. $0.98 rolls of cellophane (cyan and magenta) from Walmart.